Prepare to add Paul Rudd and Emile Hirsch to the list of superb comedy duos as result of ‘Prince Avalanche’, the mirthful new film from writer/director, David Gordon Green. The humour is ace and the film has a strong emotional backbone that moves you from laughing at the characters to laughing with them. In the summer of 1988 two road workers, Alvin (Rudd) and Lance (Hirsch) are tasked with doing maintenance on an area of bush land recently destroyed by a fire. Isolation forces an uneasy friendship that results in odd conversations and misadventures. Not a lot happens in ‘Prince Avalanche’ plot wise, but through Alvin and Lance you witness the birth of a friendship. It’s established that Alvin and Lance’s relationship is one of convenience. They are not only thrown together because of work, but Alvin hired Lance because he is dating his sister. In the seclusion of nature they annoy each other and have hilarious bouts of awkward banter. Alvin’s maturity and respect for the work puts him at odds with Lance’s short attention span and yearning for the city lifestyle. Discussions reveal what motivates each character as well as their interactions with a crazy local truck driver (Lance LeGault in fine form) and a local woman looking for possessions in her burnt out house. It’s touching to watch Alvin and Lane’s forced acquaintance evolve into a genuine friendship. Rudd and Hirsch complement each other brilliantly as they develop an amicable respect for each other and indulge in each character’s dunderhead ways. Almost every word that comes out of Rudd’s mouth raises a chuckle and it’s impressive to see him take the most mundane words and spin them into comedy gold. Hirsch’s youthful arrogance combined with his foolishness makes him a loveable fool and it’s a career best so far for the actor. Gordon Green lets his two leading men shine and crafts beautiful montages of their merriment that’s complimented by a wonderful score by David Wingo and Explosions in the Sky. These tender artistic flourishes are complimented by the work of cinematographer, Tim Orr, who captures beauty in the ashes. Bubbling beneath this tale of companionship are strong themes of resurgence as the charred forest around the two characters shows signs of regrowth with their new-found camaraderie. Even the dividing lines Alvin and Lance paint onto the road suggests they are laying down the foundations for a bond that will last till those lines fade away. 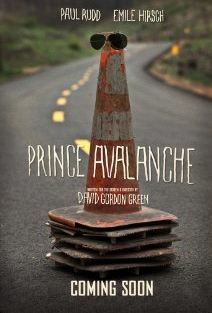 ‘Prince Avalanche’ is a very moving film. It functions on so many different levels of the emotional spectrum that you may find tears of laughter mixed with the sobs of heartache. It elicits a passionate response from subtle and beautiful execution.